Press conference on one-year anniversary of erection of fence separating the village from the Gureombi coastline and to signal the start of International Solidarity Week, Sept. 2-9. Traditional Jeju shaman ritual, village tour, dinner & candlelight vigil. National Assembly member and Jeju native Jang Hana to speak. Visitors from all over South Korea come to support the anti-base movement. Take Boat ride through a UNESCO biosphere reserve, and see how the navy-base project will destroy many endangered species there. 20 person limit each time. 10,000 won. “Earth Democracy and the Biosphere Ethics Initiative: Ethical arguments in biodiversity conservation” (CEL official session). Discussion of relationship between Gangjeong sacred sites and policy. Film followed by musical performance. 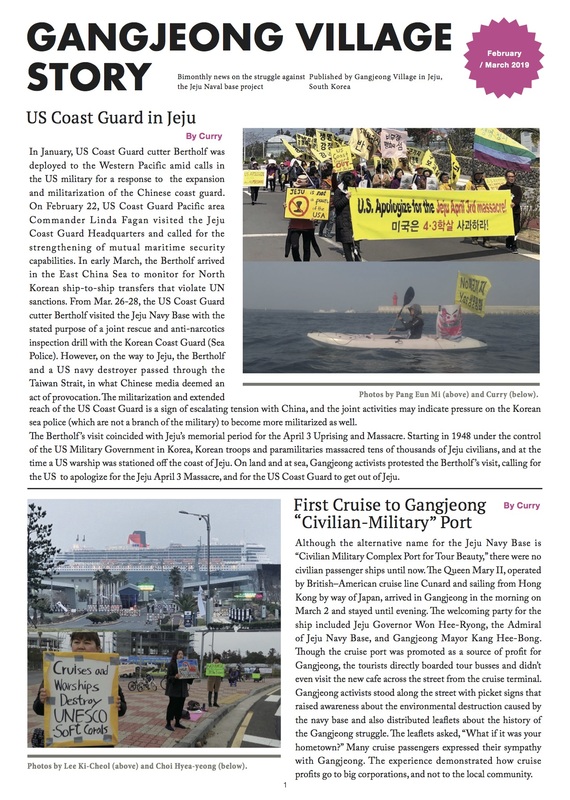 Tour Gangjeong’s sacred sites on both land and at sea, and the military desecration. 20 person limit. 10,000 won. NOTE: Candlelight vigils take place in Gangjeong every night at 8:00. Everyone welcome. To reserve a spot on Gangjeong tours contact gangjeongintl@gmail.com. Click here for directions to Gangjeong.